Last weekend saw the running of the 34th (!) 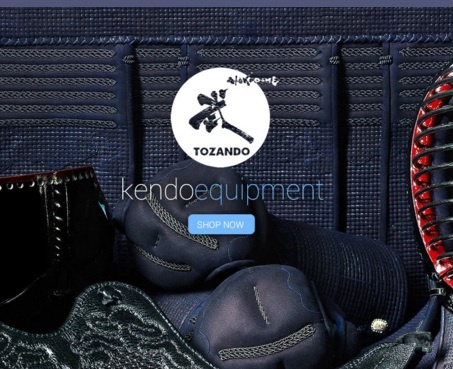 Victorian Kendo Championships. 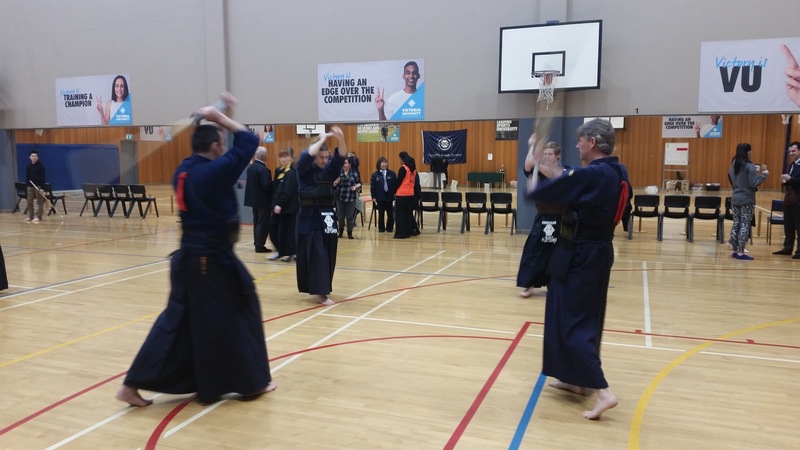 Over the two days there were 10 separate competitions held, a massive organisational undertaking and superbly well run by Ballarat and Apollo Bay Kendo Clubs, and their volunteers. In my mind, these guys are the most important people of all those who attend. Our club had its best ever attendance. On Saturday, Quinn and Andrew competed in the Kyu individual event, a very difficult division because it contains such a wide range of skill levels. Well done to you both. 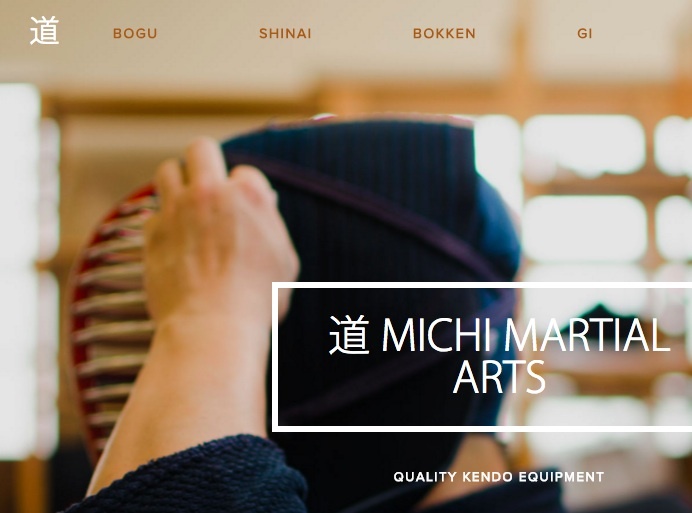 Each shiai is like months of jigeiko disstilled into a few short minutes. There's lots to reflect on afterwards, but also lots of momentum and passion that can carry through into training as well. One valuable lesson from this campaign was the role and type of warm-up required. We decided that a short warm-up with full-bogu at high intensity is preferable to a suburi-only warm up. We'll remember this for next time. Thanks to Alex we were able to field a complete team in the open team division. 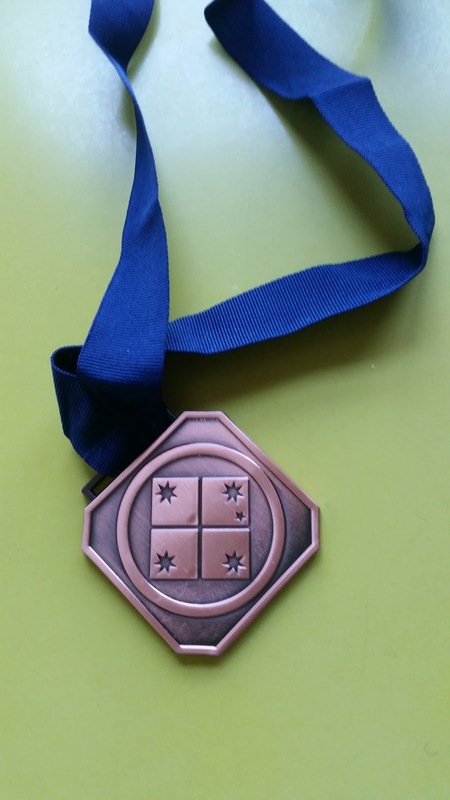 Our match was against South Australia, who often field a team in the Victorian championships. Our fighting order was Alex (senpo), Soon (jiho), Sean (chuken), James (fukusho) and me (taisho). This order worked well. 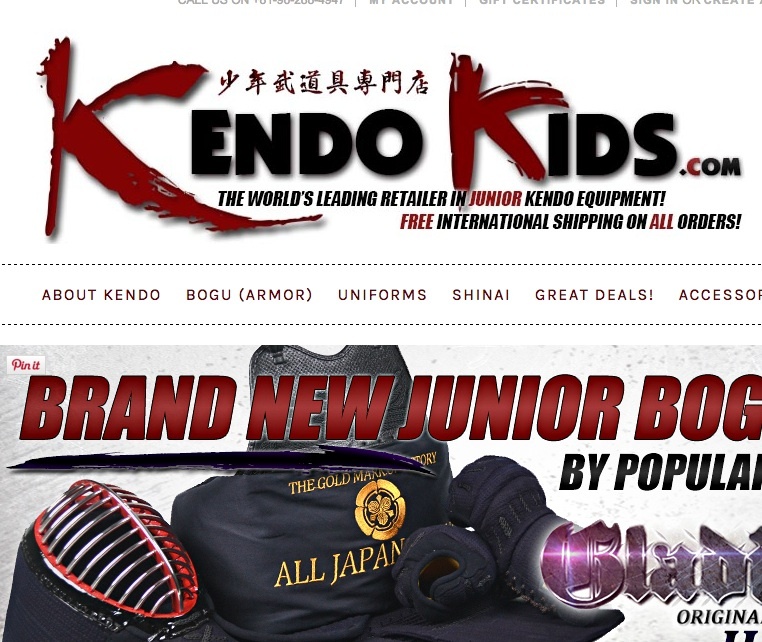 Alex came up against a nito (two swords) kenshi and did amazingly well. He didn't win, but I spoke to his opponent afterwards and he said Alex was a very difficult opponent and that his strategy of playing very straight was absolutely the right way to deal with nito. 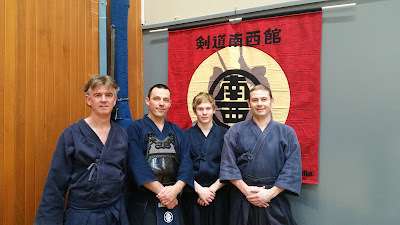 Soon was next and being his first real shiai, it was a huge learning experience. Sean's role as chuken was pivotal as it was the deciding match: a draw would keep our hopes alive, a loss would seal our fate. Sean was not at all outclassed but in the end conceded a point to his opponent. 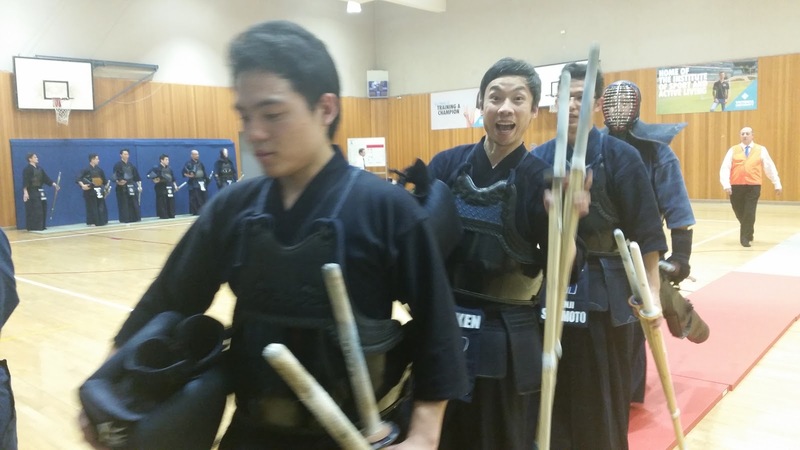 He was unlucky to attract two hansoku (shinai-hanashi and jogai) which decided the match. 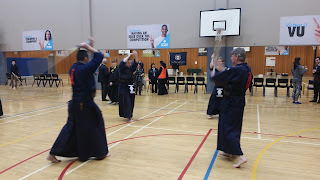 James came next with nothing to lose and he demonstrated his favourite waza which is unfortunately difficult for some shinpan to observe. After having the first point given against him, he lifted and scored two decisive and unequivocal men-uchi to win the match. 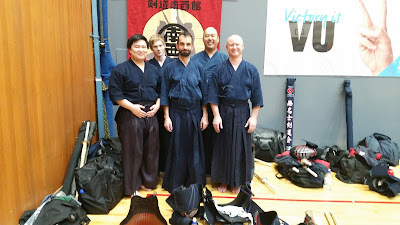 I came next, and after losing the pool matches in the Veteran's division, I was determined to fight with more positive Kendo. My first debana-kote was not awarded, but I made sure the next two were, and I was able to salvage some pride. In the end, to go down 3-2 was not a bad result. We can turn that third match next year! Overall I was extremely happy with how we went this year. There are clear things we can work on, but we have improved since our last outing by a long way, and we did much better than I had hoped. reserve myself a position as coach for kyu teams so that I can be on hand to assist and not have to be a shinpan! Happy victory face: the Open Team winners MUKEN.